* school and education policy. Over half of the readings focus on real life cases - such as pupils, teachers, classrooms or schools - as a means of conveying some of the interpersonal subtleties of teaching and learning in primary schools. 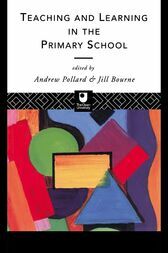 At the same time, these cases highlight important current topics and debates in primary education and often provide insights into practical ways of meeting the challenges which are posed. Other articles are more explicitly analytical and provide conceptual frameworks, overviews or critiques of their fields. This is an excellent resource and guide for primary school teachers, and students studying on PGCE courses.